This block was inspired by one of our hosts, Yvonne from Quilting Jetgirl. 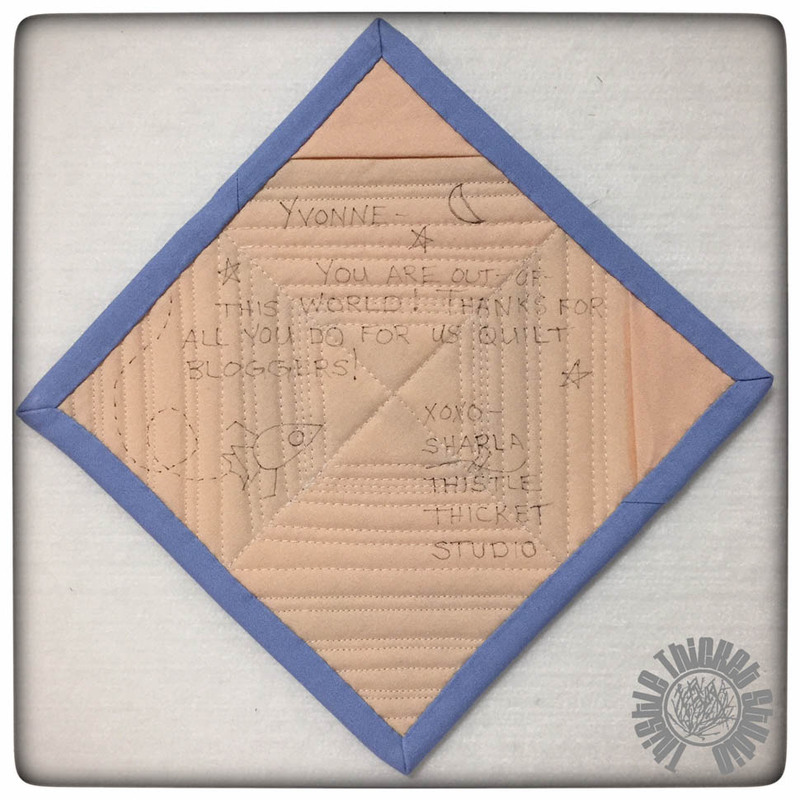 Yvonne was my mentor last year in the 2015 New Quilt Bloggers group and she has provided me with lots of invaluable insight into the blogging world in the last year and inspired me with her quilting. 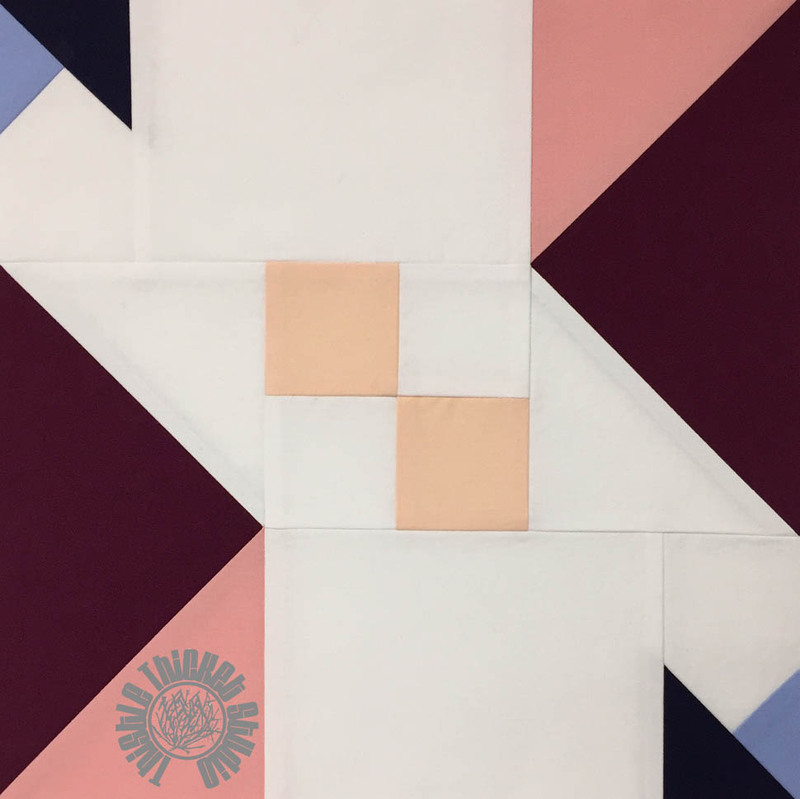 Many of the quilt blocks she designs are modern and abstract as a single block goes, but when multiple blocks are put together they create a secondary design in the quilt. Her block designs inspired me to explore that idea which led me to this Spinners block. Thank you Yvonne for your online friendship! When you look at my block individually, I'm sure you wonder where the name Spinners came from. But when multiple blocks are combined, a wonderful design of spinners emerges! Click here for a free printable pattern of my Spinners block. 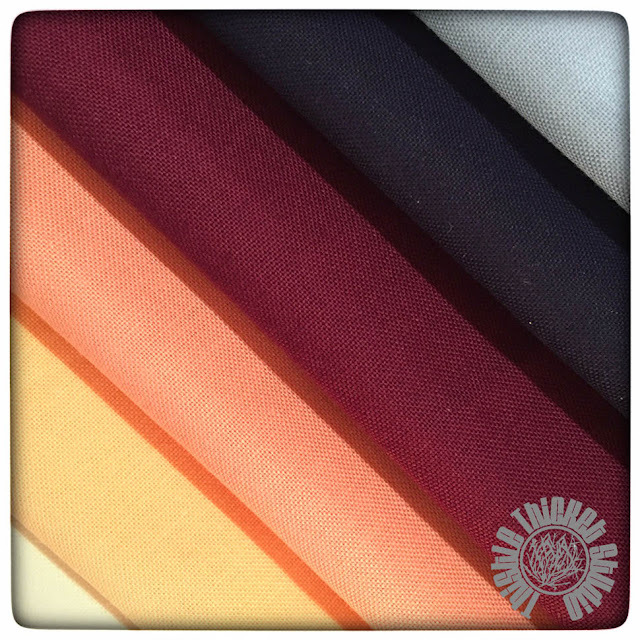 The block features fabrics from Paintbrush Studio's new Painter's Palette Solids Collection in Midnight, Daydream, White, Peach, Coral and Bordeaux. You can check out the entire collection of Painter's Palette here. This fabric has a wonderful weight and was so nice to work with! If you follow Yvonne on her blog or on Instagram, you know that she likes to make mini mini quilts and exchange with online quilting friends. When I made my first two mini minis last fall, Yvonne asked if I would like to trade. I said yes, of course, but was busy spoiling my grandbabies and didn't have my sewing machine so I asked if we could do it after the first of the year. Since Yvonne is one of the hosts for this blog hop, she is the person who is collecting the completed blocks that will be made into charity quilts. So I decided to take the leftover scrap triangles created when making my block and create a mini mini for her to include in my block package. I hope you like it Yvonne! Don't forget to sign up for the Ocean Sunrise half-yard fabric bundle giveaway while at Stephanie's blog, and then stop by Paintbrush Studio's blog "Inspired By Fabric" to sign up for another half-yard bundle giveaway! P.S. You can see all of the blocks designed for this blog hop on the Paintbrush Studio 2016 Blocks Pinterest Board! 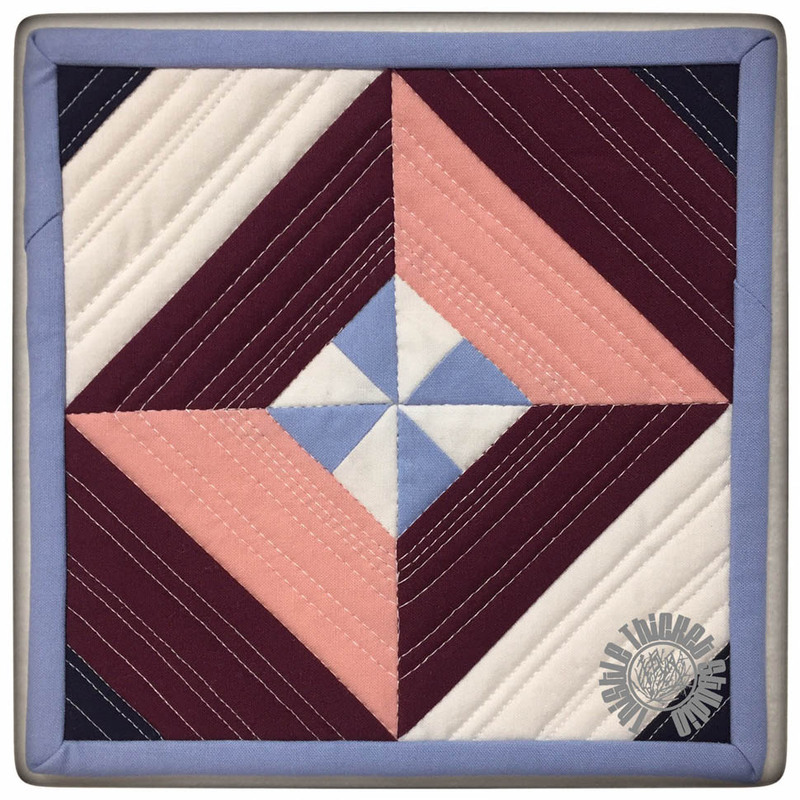 I love the secondary design that your block makes, Sharla - I especially like that the pinwheels / spinners are different sizes and offer so much negative space around them. Thank you so very much for the mini quilt; it is hanging in my sewing room (ack, did I send you a mini mini quilt?). Thank you so much for joining the hop. I am loving these blocks that make such unexpected repeats! Sweet mini-mini...perfect timing! I too love the secondary patterns in a block, so much potential based on fabric, color and placement. Also, thanks for creating the Pinterest board with all the blocks! Wonderful block, top and thanks for sharing the pattern. Would look great in scraps. The secondary design was both unexpected and delightful. Great block! Wow. the second design block caught my eye.Fantastic! This is an excellent block. Love it and well done. This is a great block! I like the secondary design. Oh my goodness!!! What a great block!! Love the secondary pattern and absolutely adore the mini for Yvonne :) xo! This might be my favorite block of the hop. I just love how you get double spinners when you put it into a quilt layout. Just stunning. Another Finish For The Finish-A-Long!